St. Berard Parish at Navajo, NM is just large enough to seat a regular Sunday crowd, but people were packed shoulder-to-shoulder for the very special Mass in honor of the church’s 50th anniversary. Families from both St. Berard and its mission church of St. Francis in Sawmill gathered together to attend the Mass celebrated by Bishop Wall and concelebrated by several Franciscan priests including Fr. Gilbert Schneider. Two Native American deacons also assisted at the Mass. Br. 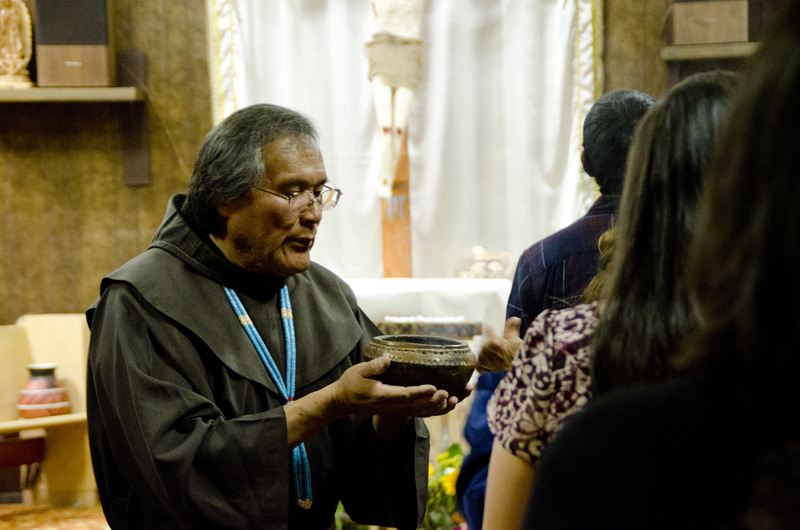 Maynard Shurley, OFM, blessed the church and the congregation before the Mass began, using Navajo incense. Two nuns – Srs. Brenner, SBS, and Sr. Maria Magdalena, SC – bustled about making sure that the food for the dinner after Mass was properly prepared and presented; that the ushers had the right amount of baskets; and that everyone had a seat for Mass. Br. Maynard Shurley, OFM, blesses the congregation before Mass. “It is our great prayer and hope that this event, this beautiful celebration, will truly be a time of growth and renewal for our people and our parish,” Fr. Gilbert Schneider declared to the congregation. Fr. Schneider is the pastor of Our Lady of the Blessed Sacrament parish in Ft. Defiance, AZ, but his duties have also included saying Mass at St. Berard and St. Francis churches for the past 11 years. Day-to-day, Srs. Brenner and Magdalena oversee the religious instruction of the parishioners and other church affairs. Sr. Brenner has lived at Navajo for three years, and cares for the people there as if they were her own family. It’s difficult to take a spare moment to talk to her during the dinner after the Mass – she spends most of the evening moving among the tables, stopping to speak to each family. She knows their names, their personalities, their backgrounds, and happily speaks with each group before moving on. Rita Bia is one of those “people of God” Sr. Brenner refers to. Raised in Sawmill, AZ and a member of St. Francis church for most of her life, she volunteers at events for both churches throughout the year. Eventually she became a certified religious instructor, and describes how she enjoys teaching her faith to her people. With Bia, too, it’s tough to grab a few moments. She spends the evening talking and laughing with people as she stands behind the food line serving dinner, and eventually divides a giant cake into smaller pieces, making sure there is enough for everyone. The anniversary of the church also happened to be Bishop Wall’s birthday. 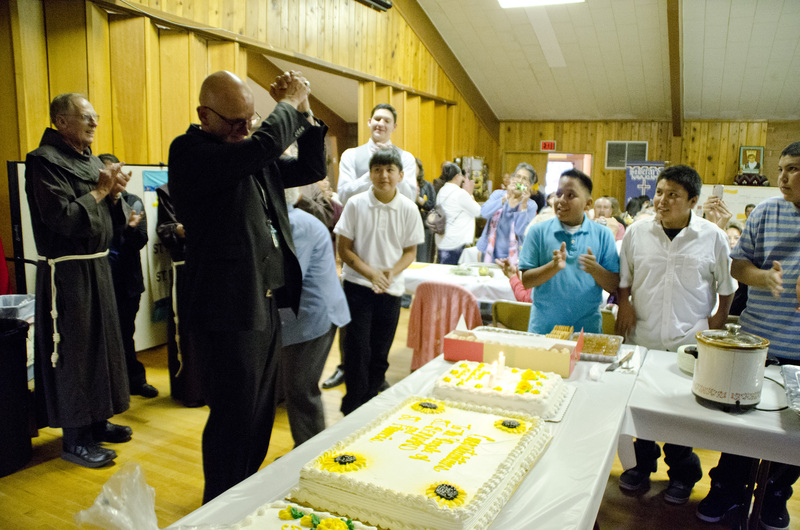 The people surprised him with a cake after the Mass. Sawmill was at one point the main parish. The town was established and named after a local lumber mill which functioned as the main economy for the town, and St. Francis church was built to serve the people there in 1953. After just five years, the mill was moved to Navajo, and most of the people went with it. St. Berard was built in 1964 and is now the main church, with Sawmill as a mission. Despite the population movements and fifty years, the people of Navajo and Sawmill are as close as ever. They are more than a community – as both Sr. Brenner and Bia say, and as any observer can see – they are a family. The 50th celebration Mass took place on Saturday, October 11, 2014.